Unwelcome Guests istoric houses and their collections are highly susceptible to insect pest infestations. Carpet beetles, webbing and case-making clothes moths, and wood boring insects are among the most common and most destructive. Recognizing signs and patterns of an infestation is crucial. The presence of live insects is an obvious indication; one should look as well for signs of activity such as cast skins, or molts; frass, or powdery excrement; tunnels in wooden objects, and holes in wool and silk fabrics. Once an object is infested, it must undergo some form of treatment to prevent further damage and spread. Instead of using highly toxic chemicals and fumigants, Historic New England favors a more sophisticated, modern method, known as a controlled-atmosphere treatment, which is both practical and safe. Historic New England’s storage facility is equipped with a unit that consists of a large wooden framework enclosed within an impermeable plastic tent-like “bubble.” After the unit has been loaded with objects to be treated, it is sealed, and carbon dioxide gas is pumped in to displace the oxygen to a percentage of 5–7 percent, which is low enough to kill all stages of the insect life cycle—adults, larvae, and pupae. Unlike alternative treatments, such as freezing, using carbon dioxide is safe for all types of museum objects because they are not exposed to extreme changes in temperature and relative humidity. During treatment, an overhead heating system and a fandriven humidification system maintains the ideal environment inside the bubble. Historic New England has safely and successfully used this method on its collections since 1992. 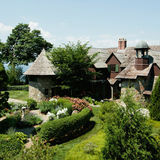 As a service, Historic New England also offers the treatment at cost to other museums, galleries, institutions, and private clients. The treatment time is four weeks. Once objects have been treated, they can be safely returned to their location and should be inspected periodically for any future pest activity. Hall had deteriorated into a maze of decrepit, ramshackle buildings and a cluster of piers surrounding the rotting Town Dock. Although Faneuil Hall itself had been enlarged in 1806, and an open shed for butchers known as the Shambles stood nearby, there was still not enough space to accommodate the expanding city’s needs for foodstuffs. Pushcarts choked the streets. At low tide, foul odors emanated from sludge trapped beneath the piers crowding the harbor. Fortunately, Boston had in its mayor, Josiah Quincy, a man of high energy dedicated to improving the city and the lives of its inhabitants. The situation compelled him to embark upon a massive undertaking of urban betterment to create a FACING PAGE Aerial view c. 1967. By this time, Parris’s masterpiece has lost its original context and entered a state of decline. Photographer unknown. ABOVE LEFT,TOP Lithograph of the market after a sketch by Alexander Jackson Davis, c. 1828. ABOVE LEFT, BOTTOM In the 1890s, meat purveyor B. Johnson chose a picture of the market as the emblem on his billhead, 1893. ABOVE RIGHT Wagons loaded with boxes of produce jam South Street, c. 1900. Photograph by F.A. Rugg. Central Market building, c.1890. Each purveyor had his own stall, as indicated by painted signage on the Doric columns. The photograph was evidently taken for promotional purposes. cal analysis became a model for subsequent historic property reports by preservation groups. ABOVE RIGHT Proposed view of the markets after restoration, c. 1968, included in the feasibility study. A more recent donation, the archive of architect William L. McQueen, AIA, who was a key staff member of both the Stahl’s and Benjamin Thompson’s project teams, will provide additional perspective on the process of the market’s reconstruction and revitalization. 2. In 1966, Boston architect Benjamin Thompson was also concerned about the fate of the marketplace, especially in light of the urban renewal movement’s practice of tearing down old buildings. In February 1967, his firm submitted an independent proposal for full reuse of all the market buildings and streets to the BRA. That proposal, which was not considered feasible, is now preserved in the Massachusetts Historical Society. 3. John Quincy recounts that Mayor White told him he brought the fivevolume feasibility study with him to Washington to demonstrate the importance of the project to federal officials and Massachusetts representatives. t has become an all too familiar scene in New England: a small crowd of onlookers huddle together near a street curb listening to the roar of a bulldozer making its way toward a small, early to mid-twentieth century house. Soon, in place of this modest house will stand an oversized house that dwarfs the remaining original residences in the neighborhood and stands as a tribute to the current culture of private convenience over community. The following morning, a newspaper headline laments the loss of yet another example of Modernist architecture designed by a person whose name sounds vaguely familiar. People in the community shake their heads and profess that they had no idea this house was significant. If only someone had known and taken action while there was still time. the project will help publicize the work of talented regional architects whose names are largely unknown. By making this database available to New England state historic preservation offices as well as state and local preservation non-profit groups, Historic New England can assist ongoing regional efforts to preserve Modernist residential architecture. Historic New England also hopes to inspire grass-roots community preservation efforts, similar to what has happened with the Hollin Hills neighborhood in Fairfax County, Virginia, a Modernist neighborhood near Washington, D.C., dating from the 1940s and consisting of approximately 450 houses designed by Charles Goodman. The community published a book chronicling its fifty-year history and established its own design review process. In 2004, a committee of residents was formed to pursue National Register designation. You can help Historic New England’s preservation efforts by sharing information on Modernist houses or architects in your community. Please contact Wendy Price at (781) 891-4882 ext. 225 or wprice@historicnewengland.org. by drying, salting, or smoking and storing it in a cool dry place. Tin food containers used in America. John L. Mason patents the Mason jar. Louis Pasteur invents pasteurization, which uses high temperatures to kill bacteria in liquids. do you know Can you guess what this is? These are ice tongs, which were used to carry large blocks of ice. Before electric refrigerators, people had ice boxes â&#x20AC;&#x201D; insulated wooden cabinets that stayed cold thanks to blocks of ice kept inside. Ice was harvested in winter from frozen lakes and ponds and stored in sawdust in ice houses. Delivery men used tongs like these to bring ice from wagon to house. word search One of the earliest ways to preserve food was DRYING. In colonial America, slices of PUMPKINS and APPLES were hung on a string to dry. Native Americans made meat and fruit. SALT can be used to preserve meat and fish. Salt draws out moisture and prevents the growth of bacteria. Sailors brought barrels of salted MEAT on long voyages. PICKLING preserves vegetables and other foods through a combination of salt and VINEGAR. CANNING keeps food from going bad by sealing it inside a sterilized, airtight container. Milk spoils quickly without refrigeration. BUTTER and CHEESE, which are made from milk, keep much longer. The invention of the REFRIGERATOR made it possible to keep foods fresh, while the FREEZER permits long-term storage of food in nearly fresh condition. Answers can be found on page 24. Ice boxes used widely in American homes. Campbell’s Soup first sold at 10 cents per can. First home refrigerators are sold. Clarence Birdseye starts the first frozen food company. Freeze-dried coffee, one of the first powdered food products, becomes available. First aluminum beverage cans sold. Make Butter Pour room-temperature cream into a clean small jar until it is onethird full. Screw the lid on tightly, and shake the jar for about ten minutes, until butter starts to form and only a small amount of liquid is left. (The liquid is buttermilk, which can be used in baking.) Drain the buttermilk, and spread the butter on crackers or bread. Add salt to taste. 1. Run jars through the dishwasher, then boil them in a large pot for 10 minutes. (Place a circular baking rack or steamer at the base of the pot to keep the jars from bouncing around the bottom.) Put the jar seals and screw lids in a smaller pot to boil separately. Leave the jars and lids submerged until the jam is ready. 2. Mash the berries a little at a time with a potato masher, then measure into a large pot. If you don’t like a lot of seeds, put some of the berries through a sieve at this time. 3. Measure the sugar into a bowl. Be sure to use the exact amount called for or the jam will not jell. “With this Ring I Thee Wed” n 1840, when Queen Victoria walked down the aisle with orange blossoms in her hair, she set a bridal fashion that crossed the Atlantic and lasted well into the twentieth century. In 1871, Harriet Fairbrother of Rhode Island wore a wreath of silk and wax orange blossoms with matching drop earrings and a gold bead necklace when she married Frank Burrough. Orange blossoms decorated the bodice of her wedding dress, which she wore with white kid slippers. Queen Victoria’s white wedding gown also established a bridal tradition. Before the royal wedding, white was often considered more appropriate for mourning, and brides wore their best clothes or had dresses made in the latest fashion. Fragments of brightly colored brocaded English silk from the dress of Prudence Jenkins of Boston, which she wore for her wedding in 1778, exemplify this practice. Prudence’s shoes sported paste buckles, probably imported from England as well. Finely made and set in silver, the buckles conveyed Prudence’s prominent status and wealth. THIS PAGE, CLOCKWISE FROM TOP Bodice of Harriet Fairbrother’s wedding dress and her white kid leather slippers, 1871. She also received a chalcedony cameo of Flora from her fiancé, Frank Burrough, which he purchased from Shreve, Crump and Low of Boston. Dorothy (Quincy) Hancock’s gold wedding band, 1775.
found in freshwater rivers. In the late eighteenth century and continuing through much of the nineteenth, suites of seed pearls were a traditional gift for brides, particularly in America, where the fashion endured long after it had waned in Europe. In 1796, the prominent Charlestown, Massachusetts, merchant, Joseph Barrell, commissioned a parure, or matching suite, from the London jeweler Stephen Twycross, as a wedding present for his daughter Hannah. The set, with its symmetrical shapes, light and airy materials, and classical symbols, is typical of the Neoclassic style. While seed pearls remained popular throughout the nineteenth century, larger, rounder oyster pearls became available after 1850, when Asian markets opened to the West, and soon had an impact on fashion. In 1871, Stephen H. Phillips gave his fiancée, Margaret Duncan, a suite of jewelry set with oyster pearls, purchased from the Boston retailer, Shreve, Crump & Low, for $790. This set, combining bridal pearls with the Victorian taste for oversized jewelry, adapts tradition to the latest fashion. In addition to pearls, jewelry made from other materials was also deemed appropriate as a wedding gift in the Victorian era. Carved ivory suites, including sheaves of wheat representing plenty and fertility, were considered suitable for young brides in the 1850s. In the second half of the nineteenth century, hair jewelry was used both as tokens of love and friendship and as memorials to the dead. Anna Wigglesworth gave her sister, Mary, a hair bracelet as an engagement present in 1864. One could either provide one’s own hair to a local hairworker, of which there were many in Boston, or buy a finished piece from a retailer. Those who wanted a more personal touch made their hair jewelry at home with kits advertised in women’s periodicals such as Godey’s Lady’s Book. Carved ivory brooch and earrings in original fitted case, c.1850. BELOW Engagement and wedding ring made by Edward Everett Oakes, Boston, Massachusetts, 1946. Visit www.HistoricNewEngland.org to see an online exhibition of jewelry, based on a research project funded by the Tiffany & Co. Foundation to catalogue more than 2,000 items in Historic New England’s jewelry collection. provide handicapped access. All aspects of this project were completed with the commitment to save and preserve existing intact building fabric. The John Robbins House is open to the public, who are welcome to enjoy this property, tour the sculptures on display on the grounds, and view the artwork for sale in its rooms and carriage shed. Through the preservation restrictions held by Historic New England, this significant property will endure as a link to Acton’s past, while commercial development continues to transform Great Road into a busy commercial strip. Historic New England’s Stewardship Program now protects more than seventy privately owned historic buildings. For more information visit www.HistoricNewEngland.org or call (781) 891-4882, ext 227. You will find orchids to match your home environment among the huge variety available at the Lyman Estate Greenhouses year round. In addition, a special orchid sale takes place October 26–28, 2007, and three programs are offered in November for those interested in learning how to grow orchids: Orchid Growing Clinic on the 10th, Beginning Orchid Growing Workshop on the 16th, and Growing Orchids Under Lights on the 30th. For more information and to register for the programs, visit www.HistoricNewEngland.org, or call (781) 891-4882, ext 244. A palette for the recent past As Historic New England’s reputation for expertise in historic paints becomes more widely known, increasing numbers of homeowners and design professionals are requesting advice on twentieth-century colors. In response to this demand, staff from Historic New England and California Products are examining Historic New England’s buildings, wallpaper collection, and paint and builders’ catalogues for color evidence. A new twentieth-century color chart, with colors suitable for American homes built between 1900 and 1980, will be available to the public next spring. The chart will include deep earth tones for Arts and Crafts and Bungalow styles; whites, grays, and primary colors for International and Modern; warm neutrals for Mission and Prairie; and, yes, avocado, turquoise, and gold for the 1960s. A web component, with downloadable color guide showing suggestions for color schemes, also will be available. Intended for a range of architectural styles across the country, the chart will satisfy the demand from homeowners who want to preserve the distinctive character of their twentieth-century homes. Historic New England staff dismantles kitchen for removal. president of O’Connor and Associates, an options and arbitrage firm headquartered in Chicago. In 1989, she founded the biennial publication Sloan’s Green Guide to Antiquing in New England, a travel guide to more than 2,500 antique shops and auctioneers in the region. Another of her interests is genealogy, and she recently served as a trustee of the New England Historic Genealogical Society. In 2007, Ms. Sloan co-chaired the highly successful 2007 Historic New England gala, a role she is repeating in 2008. Colin L. M. Smith, FAIA, is a principal of Architectural Resources Cambridge (ARC), a nationally known design firm whose buildings include the John F. Kennedy School at Harvard University and the Boston University Boathouse, both in Cambridge, Massachusetts, and the Genzyme Building in Boston. A native of England, he studied architecture at Harvard and worked at Benjamin Thompson Architects and at The Architects Collaborative before founding ARC. Members’ Month Highlights In June, members flocked to exclusive Members’ Month events. They attended programs on early aviation, seventeenth-century architecture, and mid-twentieth-century furniture. They feasted on local produce at a strawberry shortcake feast in Rhode Island and sipped Roseland Red wine at a wine tasting in Connecticut. We were delighted to welcome so many members to share our collections, sites, landscapes, and passion for the region. RIGHT Samuel McIntire embellished the mahogany foot posts of the Lyman bed with carved acanthus leaves, roses, and drapery festoons. Gift of Cynthia Forbes Lyman. I am honored to serve as chairman of the board of trustees as we approach the centennial of this wonderful organization. Our trustees strive to continue the vision of Historic New England’s founder, William Sumner Appleton, for the preservation of the region’s cultural and architectural heritage. Appleton knew that not every old building of merit would be viable as a museum, so he sought creative ways to make a building support itself while continuing to play an active role in its community’s daily life. This magazine contains two articles that demonstrate practical applications of Appleton’s goal. 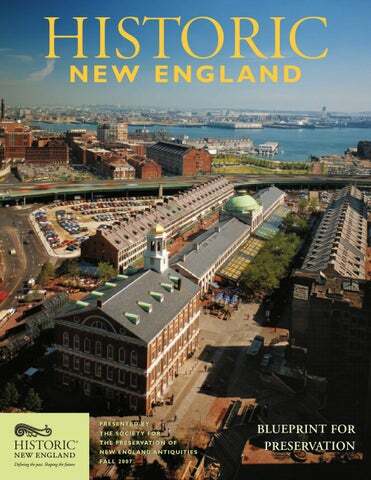 The cover story narrates Historic New England’s involvement in the preservation of Boston’s Quincy Market complex, whose transformation into the vibrant Faneuil Hall Marketplace is one of the twentieth century’s great urban success stories. A second article chronicles the preservation of the John Robbins House in Acton, Massachusetts, thanks to the dedication and vision of both its former and its present owners, who worked with staff of Historic New England’s Stewardship Program to ensure its protection. This program, based on principles Appleton articulated nearly a century ago, now protects seventy-five properties throughout the region. I think he would be very pleased.